Yes, I know. PowerPoint has achieved ubiquity – it’s like the Kleenex of slide presentations. Lately you may have heard that those bullet points you use in your presentations aren’t so effective. Additionally, you may have begun observing a new trend of slides littered with Flickr images. Not that I’m dismissing the effectivenes of images, but, practically speaking, is there really time to find an image for every message you want to convey to your audience? Point being, for better or worse, we still use lists with bullet points sometimes. 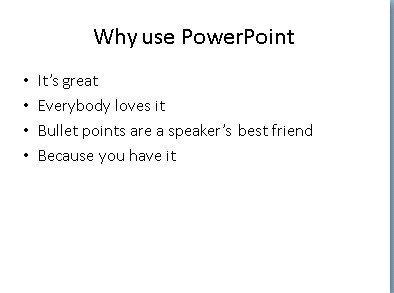 Now, thanks to the help of PowerPoint’s “SmartArt Graphics”, you can easily turn your mundane bullet points into visually stunning gems of knowledge. 1. Make your list, like you always do. (Go ahead, admit it.) Check out my mundane slide in Figure 1 if you need inspiration. Fig. 1. A typical slide with bullet points. 2. Select the text box that contains your bullet points. 3. Click the SmartArt icon in the “Paragraph” section of the “Home” ribbon (see Figure 2). Fig. 2. The SmartArt icon, located in the "Paragraph" section of the "Home" ribbon. 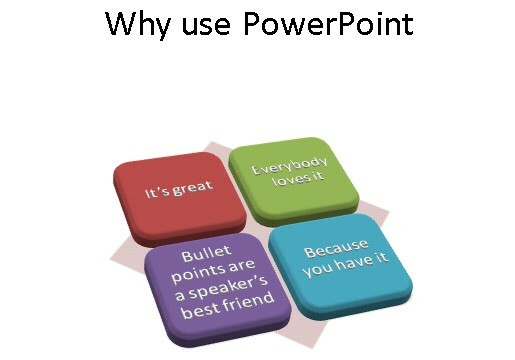 And, your ticket to PowerPoint success. 4. Choose your preferred SmartArt graphic (hint: hovering over a particular SmartArt graphic will give you a preview of your transformed bullet points). Fig. 3. Your transformed slide after applying one of the SmartArt Graphics. Getting better. It’s better, but you’re not done yet! Next, with the SmartArt version of your bullet points selected (make sure you choose the whole graphic rather than just part of it), click on the “Design” ribbon (Figure 4). Fig. 4. The "Design" ribbon has tools for enhancing your SmartArt graphic. From here, you can change the colors and the style of your SmartArt graphic. Your B&W bullet points seem light years away now! Fig. 5. The finished product. Your bullet points, transformed by SmartArt and its color and style features. Different SmartArt Graphics work better for different types of information. Some are good for representing processes – the design cycle, for instance. Others work best for hierarchical information. Choose “More SmartArt Graphics…” for a categorized list with descriptions. Hello, I found your blog via the C & RL News article. 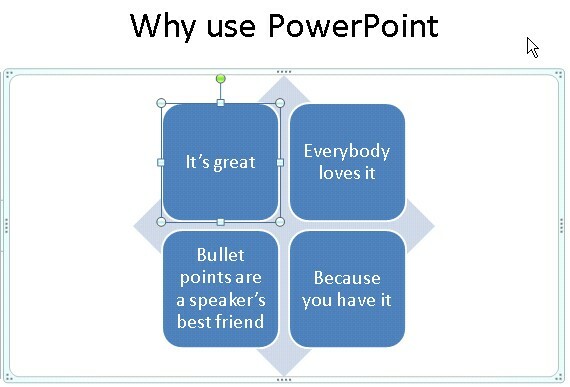 I had no idea that you could do this in PowerPoint. Thanks!